The Seattle City Council met on Tuesday for the first time to consider Mayor Ed Murray’s Move Seattle initiative—a nine-year, $930 million property tax levy—to fund a multitude of transportation projects. The current levy, known as Bridging the Gap, expires at the end of this year. Approved in 2006 for $365 million, it accounts for 25% of the Seattle Department of Transportation budget. The Mayor’s new proposal more than doubles that funding to provide for road and bridge maintenance, transit expansion, and pedestrian and bike improvements. Still, some advocates say it falls short. A representative from Seattle Neighborhood Greenways testified that as much as $2.5 billion is required for pedestrian infrastructure, $500 million for bike infrastructure, and millions more for safe corridors for students traveling to school. The Cascade Bicycle Club also called on the Council to ensure the plan implements Vision Zero and at least half of the 20-year Bicycle Master Plan. While the price tag is steep, the Council appears to believe that voters will pay. According to one poll by the Puget Sound Regional Council, residents ranked transportation as the top issue facing the region. Similarly, the Seattle Times released a survey showing that Central Seattle residents ranked walkability, commute, proximity to public transit, and affordability as their top considerations on where to live. Indeed, voters have been generous, approving two recent property tax measures to fund a city-run preschool program and the new Seattle Park District. They will soon be asked to fund an $11-15 billion measure for ST3, Sound Transit’s next wave of expansion. And several campaigns are eyeing property tax levies to fund municipal broadband, public campaign financing, an expansion of the Pre-K program, and affordable housing. Councilmembers Licata, Okamoto, O’Brien, and Godden all expressed varying levels of concern about the state-imposed ceiling on the City’s property tax capacity (currently $3.60 per $1000 of assessed value). Staff assured them that there is still plenty of capacity left—enough to triple the current low-income housing levy. They counseled that the voter’s willingness to pay would likely be a more pressing concern than the legal capacity. But the Councilmembers were on to something. Seattle has increasingly turned to property tax levies to fund a range of special projects that would enrich our city. We like to maintain a high standard of social welfare with lush parks, equitable education opportunities, affordable housing, and a reliable transportation system. But levies are a tool designed to fund special projects like one-time expansions or capital projects. They require periodic approval from voters, increasing accountability but also forcing elected officials to sell large packages to the public with shiny new projects to the detriment of basic maintenance. That’s why the Seattle Parks Oversight Committee Parks Legacy Committee recommended switching to a Parks District over the old levy system. And voters agreed. Staff pointed to Tim Eyman’s infamous Initiative 747 for their reliance on levies. Passed by voters in 2001, the measure limits property tax increases to 1% year—that’s less than 2-3% annual inflation, ensuring that property tax measures will face a slow and steady death. 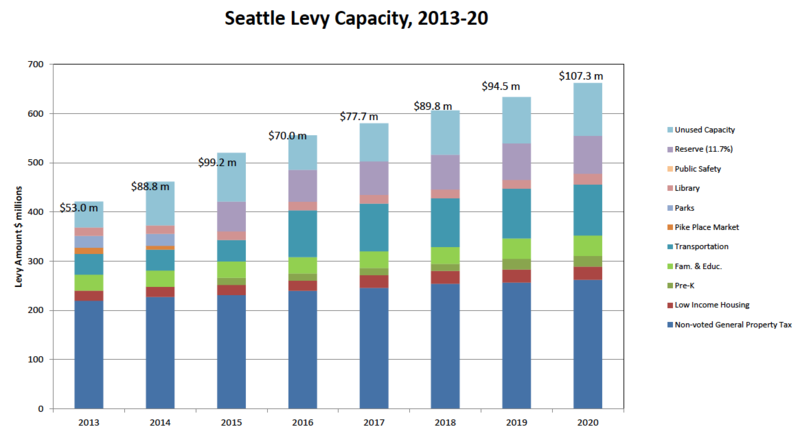 In response, the City now uses 25% of its levy capacity to boost the general fund. That’s millions of dollars in reserved levy capacity that may ultimately force voters to scale back or choose between upcoming ballot initiatives. Ultimately the City will need to demand a better revenue system from the state. Right now, Washington State has the most regressive and unstable revenue systems in the country. Poor residents pay almost 17% of their income in state and local taxes, while the wealthiest few pay just 2%. Figures like these have pushed officials to push for a host of new revenue streams, like an capital gains tax, a carbon tax, and an income tax. If Seattle voters don’t want to see their visions of an urban utopia dashed by the likes of Tim Eyman, they’ll need to show up at the voting booth to say so. They can start by approving the Move Seattle initiative. The Select Committee on Transportation Funding, made up of all nine City Councilmembers, will meet next on May 29th at 9:00am in City Hall. They will also hold a public hearing on June 2nd at 5:30pm. Show up and let the Council know what transportation projects matter to you.